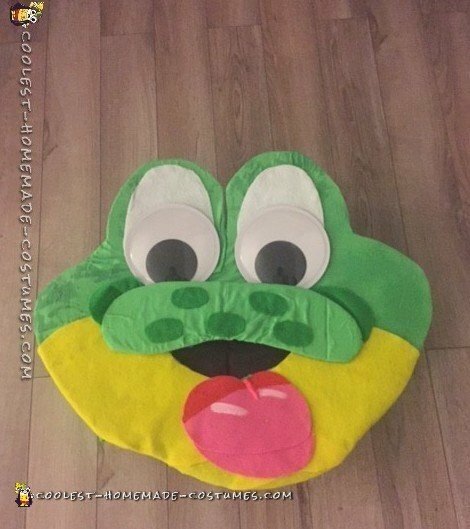 Cool DIY Frog Costume - Honey Smacks the Frog! Each year I spend months thinking of what to be for Halloween. Since I make my costume each year I have to really think of ideas that are realistic to make. And, without spending a ton of money. I try to come up with costumes that are recognizable and/or nostalgic to my family and friends. 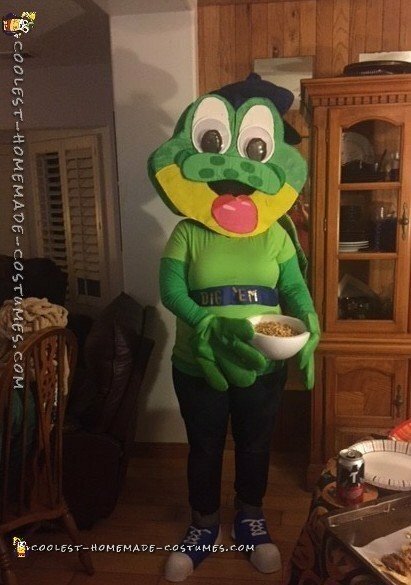 This year after contemplating several costumes I came up with the idea to make a Honey Smacks Frog costume. This was cereal that I loved as a kid and ate all the time with my family. So, I figured it would be a great costume for 2016. 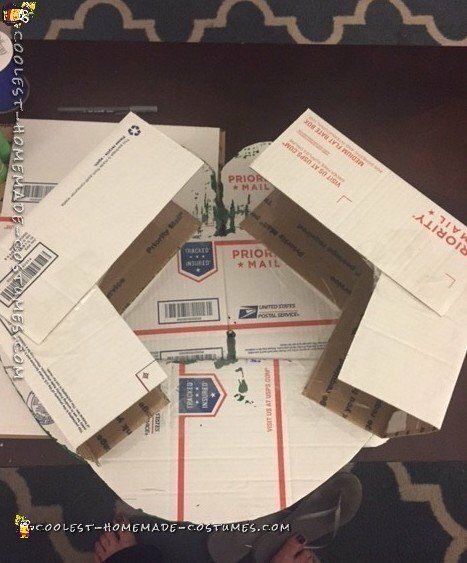 The items that I used were free boxes from the Post Office, felt and other fabric materials. More materials included spray glue, hot glue gun, googly eyes, paint/puff paint, nylons, personal clothing ribbon and glitter stickers. It’s always great when you can recycle! The costume hat, cartoon gloves and costume shoes were all old things that I reused. I used the boxes to frame the costume and cut out the front and back shape of the head and then covered all of it with green fabric using spray glue. I used extra cardboard from the boxes to create the nose and also covered that in green fabric. For the mouth, tongue, and details on the nose and eyes, I used the different colored felt fabric. Once I had it all laid out I used a hot glue gun to secure everything together. I then cut out a small hole in the mouth and covered it with black nylon. This enabled me to see out of the costume when it was on. To finish off the head I glued the googly eyes onto the costume and then outlined the edges, eyes, nose, mouth and tongue with matching puff paint for added details. I painted both the reused hat and shoes to match the blue of the Dig’em Frog costume. The jeans, green long sleeved shirt and green short-sleeved shirt are all my own personal clothing. I glued a blue ribbon with the glitter gold stickers to the outer-layered shirt to spell out the words Dig’em. 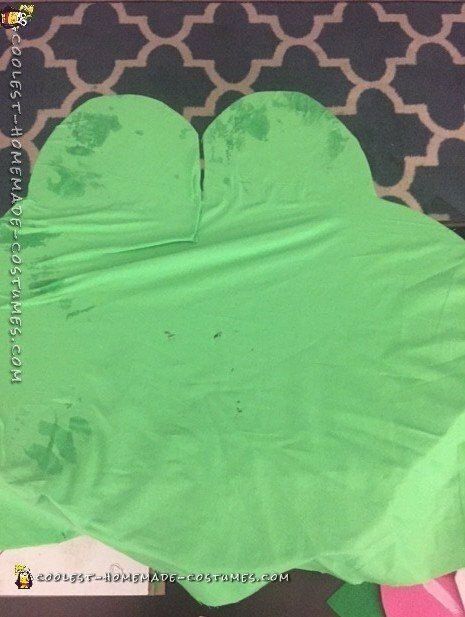 To finish off the costume I had painted the cartoon gloves green to finish off the costume I had painted the cartoon gloves green and used a Styrofoam bowl with real Honey Smacks in it for some added details. I have been making my own Halloween costumes since 2004. Each year I receive text messages, social media messages, and even people asking me in person constantly what I plan to be for Halloween. I keep it a secret every year and only reveal it on either Halloween night or before if there is a pre-Halloween party. 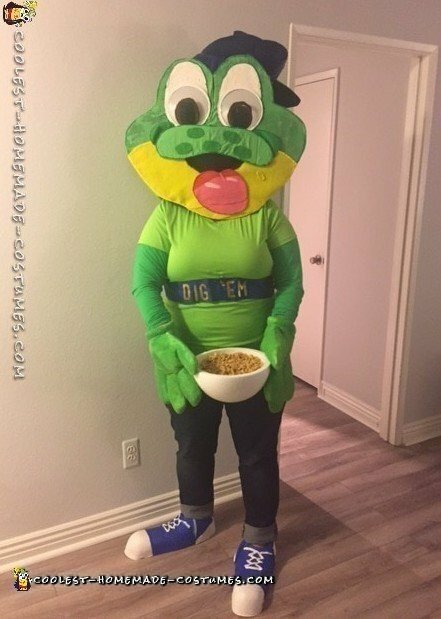 This year’s Honey Smacks frog costume was a huge hit amongst both adults and kids. I even had kids asking me for the left over Honey Smacks. This year I had over a hundred likes on my social media pages for my costume design with a lot of praise on my creativity. For anyone nostalgic, here’s more about “Dig’em Frog”.